A hum of activity fills the Bradley University laboratory. It’s a typical enough sound, but what’s happening on this hot, humid July day is far from commonplace. Forty seventh- and eighth- grade girls are simulating what happens to rainwater that falls in urban Peoria. Using water, cups and sponges as stand-ins for rainstorms, the Illinois River and the city landscape, the girls are able to draw parallels with Peoria’s combined sewer overflow pollution issues. 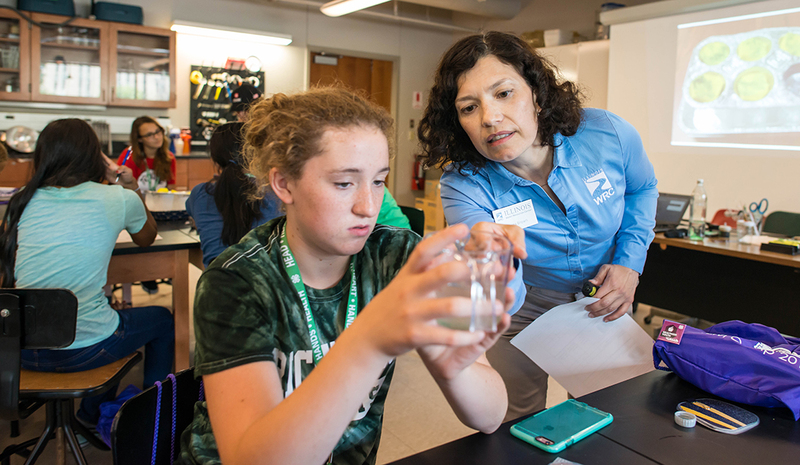 The workshop, led by Illinois Water Resources Center Storm- water Specialist Eliana Brown, was part of a STEM—science, technology, engineering and mathematics—camp coordinated by University of Illinois Extension 4-H and Bradley University. “I want to empower them to transform their community and be the generation that creates the change that has to happen,” added Brown, who spent the bulk to the workshop introducing camp participants to nature-based solutions like rain gardens. This wasn’t the first time Brown talked to Peoria youth about stormwater pollution and management. Earlier in the year, she joined forces with Illinois-Indiana Sea Grant’s Adrianne Gulley to educate the five high school students behind the Bright Side of the South Side beautification project. Part of the Illinois 4-H Spark Tank program, the project aims in part to encourage the use of native plants in Peoria’s under- represented South Side.